Ahhh, now what to do with the left over bird carcass...you know, the turkey and chicken bones from all the winter feasting. It always seems like such a waste to just throw them out. 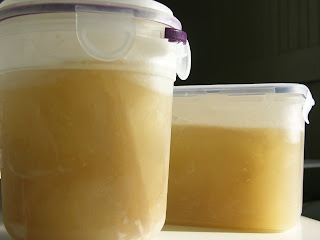 A good way to make use of them, provided you have a lot of tupperware and freezer space, is to make a stock from the bones. (It also helps you get rid of any veggies that might be getting ready to spoil.) It's simple, just throw a bunch of stuff in a large pot with water, and cook it down for a few hours. Strain it, then store it in the freezer to use later in soups and risottos. You'll be amazed at the difference between store bought and homemade. Put turkey bones/remains in a large pot (12 quarts) and cover completely with water. Go ahead and start heating up the water. Meanwhile, cut the veggies into manageable pieces, just small enough to fit in the pot. Leave the garlic cloves whole, and parsley can go in stems and all. Add all ingredients to the stock pot and bring to a boil, then let simmer for about 2-3 hours, or until desired potency is reached. Let cool for about an hour. Strain any unwanted fat, then strain the liquid through a large mesh strainer. Discard solids. Portion into small tupperware containers to pull out of the freezer as needed. The amount of stock you'll end up with will vary depending on how long you cook the liquid and how much water you decide to add, but using an average sized bird in a 12 quart pot, expect an average of 4-5 quarts to store.